Hello, today we are going to discuss on multi level category system in CodeIgniter which is a very common and essential module or feature of any e-commerce websites or any website. 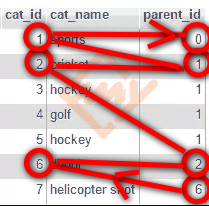 Creating nested category system is not as easy as you think, but it is not impossible too. Here I am going to deliver full step by step tutorial on how you can create such kind of module using Codeigniter & MySql. This module is based on the recursive function concept. So let’s get started to develop multi level nested category system, carefully read below steps mentioned. I am assuming that you are familiar with CodeIgniter’s MVC structure, so I’m not going to explain what model and controller in CI are. SQL code for categories table, open SQL tab in PhpMyAdmin and run below code. in controller “categories()” function the variable $data stores all the categories available in your categories table. As you can see $data is an array, you can easily parse this array into any multi level menu item or lists. If you find this article helpful please don’t get shy to share this article with your friends. First of all thank you for your letter, how can we foreach in a select in this usage? sorry! I’m not getting your point, please explain widely , so then I can help you. i want to display menu using this array. how can i do? as all the data stored in "$data" variable (see step 3. ), I'm using unordered list here you can use bootstrap menu as well. you’re most welcome, happy to help ya, just keep visiting. my english not well but i try to ask something. Yeah you have create pagination module separately. Not to worry about it, I will post about pagination in my next article for you. It is multi level but not n level. I think if we want n level approach we need a recursive function. Actually it is a n level function, you can use it what level you want. I didn’t get it, please explain your requirements more precisely. I need to print based on the categories from different printers. how can i do..? @Rajes, please elaborate your problem, I didn’t get you. How to Edit Delete N Level categories Subcategories code-igniter. Please Send me the Code immediately. You’re most welcome @Kowsar, just keep visiting. Thanks for sharing this. Helped me answering a few Q about category setup. I’m using Codeigniter to build a rather large application, and is about to start on a custom inventory/stock management. How would you go about to get the main parent category from an entry registered under the, say.. third child category in an Sql statement? very simple but tricky task, try to check category’s parent_id until and unless it gets 0 (zero). I’m just not sure if the best way is to do this in the code, or if there is an SQL statement to do it. I’ll try a bit and see what i come up with. we’re creating an object sub, which holds sub-categories if available. I have followed your program and brought final output in array format. Now i need to print this array in form of unordered list on view page. How can i do that? Thanks for your help!!! it worked….!!!! its glad to help ya!, keep visiting. hiii can you help me out with the code of printing parent in front of child in a table. Thank you in advance. could you let me know with the level of your array please? I want this in table format. for this, I’d require your JSON encoded array, it’ll help me to understand better. This is my json encoded file. Please reply as soon as possible. Thank you. Hi… i am totally new to codeigniter and this is the best tutorial i have found for categories… however, i have a question: how do we pass the data to the view or how do we call it where we want it to be? Any help is greatly appreciated! Thanks! finally call fetch_menu($categories) function where you want your menu to be displayed. you are most welcome @Staria. Thank you sharing your work. With this solution how would you resolve the URL situation for sub categories and sub sub categories? With friendly seo urls, how would you present the url/category-name/sub-cat/sub-sub-cat and how would the route file look like? you could use my above solution in your case as well, you just have to change the table name in sub_categories function.